Facebook at their F8 developers conference launched the new Timeline Profile which is totally new and revamped version of the previous profile. Timeline Profile gives a large header space on top of your profile on which you can upload your photo but as usual creativity will find it’s way in those new timeline profiles. Here is a list of Facebook Timeline Profile cover photos which are creative and awesome. You can made yours too and if it’s good you can send it to us we will upload it too. Take a look on how facebook like button can be used everywhere. I hope you liked these timeline ideas. Have you given yours one a creative look too? Do leave the link in comment to let us get inspired. A new profile style, released by Facebook. Haha, these Facebook profile covers are so funny! I just love the one with the doodles and the one with the umbrella. They’re just awesome! You forgot to mention http://facebookprofilecovers.org – Thousands of free covers to customize your Facebook profile with! Get cool facebook covers for your timeline profile by choosing between a variety. Here is my cover pic with my wife and incoming baby! I created a photoshop template to help create my own Facebook Covers – would be great if you could give it a mention! http://www.myFBCovers.com has some cool facebook covers and great features like the ability to make a photo collage cover of your friends! Here’s my totally epic one! I change it often with the same theme though. Facebook have done a gud job by enabling timeline for all profiles this will help us to style facebook profiles.http://99coverphotos.com/ also has some cool facebook covers and great features like the ability to make a photo collage cover of your friends! I am going to do some creative covers for myself! 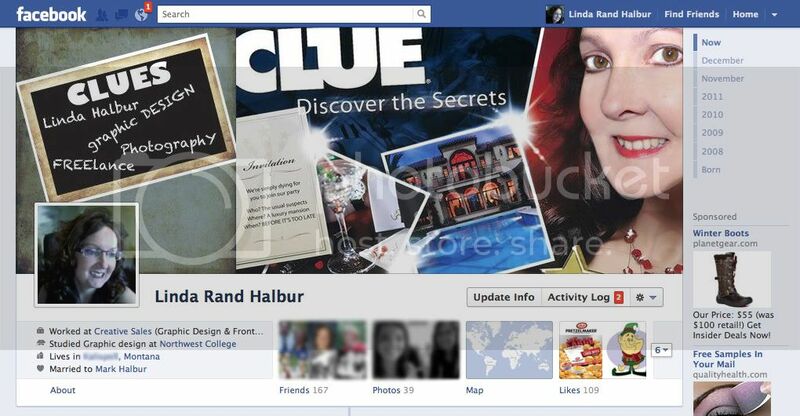 Here is the Facebook Timeline Clue Cover I created. how do you even make one of these ideas on your own? like how do you perfectly line up your profile picture and cover photo and know where they will connect? You could do a search as to how to create facebook timeline pics. You will get some really food sites there!!! I’d love to design!especially when i’m in the field of teaching!comprehend to my profiles!i’d love to create something new!coz i remember my cousin kat!kat!the 1st time i saaw him in facebook she got a beautiful creative profile!i’d like to do that also! this is really creative. its really beautiful. I take on Super Mario in mine! what about this site: http://www.profiletimelinecover.com/? I saw that it has many related articles. There is a new application Cool Cover (http://coolfbcover.com/) which lets you combine your profile and cover pictures from a single picture (taken from an url or from your pc or from your webcam. Soon will be added features to manipulate the image to add some great effects and event some cool templates to choose from, check it out at http://coolfbcover.com/ ! You can also use http://www.firecover.in for creating a Cover Image, with your name set on fire. Its Amazing for timeline picture facebook…..